Japan System Techniques Co., Ltd.
* Share price as of closing on December 24, 2013. Number of shares outstanding as of most recent quarter end excludes treasury shares. ROE and BPS are based on actual results of the previous term end. * Estimates are those of the Company. * This Bridge Report provides information about Japan System Techniques Co., Ltd., including a review of first half of fiscal year March 2014 earnings. Individualized contracted software development, sale and related services of operational reform packages for schools, IT equipment sales and IT/telecom infrastructure construction, and others accounted for 63.9%, 18.9%, 16.3%, and 0.9% of fiscal year March 2013 sales respectively. Japan System Techniques (JAST) was established in March 1973. JAST has been providing packaged software to educational institutions since the first half of the 1990s, with the launch of the "GAKUEN Series" of integrated support system packaged software for educational institutions in October 1994, the "GAKUEN REVOLUTION (Operations)" ERP for large universities in August 1998, and the "UNIVERSAL PASSPORT" school related information network web service system in February 2000. JAST was listed on the JASDAQ market in November 2001, and moved to the Second Section of the Tokyo Stock Exchange in February 2003. With the corporate slogan of "contributing to society through the creation and provision of informational services," JAST's position of full independence by not belonging to any group of companies allows it to constantly take on new technological challenges and perform a wide range of developmental tasks to be provided to various industries, using various technologies and platforms as part of its basic corporate policy. In accordance with this basic policy, JAST endeavors to maximize value for customers, shareholders, employees and society and has established a goal of realizing stable growth by creating a "win-win" relationship with each of the four stakeholder groups. Furthermore, information services for each and every employee that is the driving force of growth is a service provided to customers with the utmost integrity (sincerity). Also, JAST views training of human resources as an area that training investments must be made. This belief in the formation of highly trained "individuals" is a core management philosophy. "Cultivating natural nobility comes before artificial rank" (by Mencius): Natural nobility refers to a naturally- granted position with the respect and trust by raising the character, class, virtues, and artificial rank refers to the outward rank, given artificially and politically. While it makes sense that the efforts to cultivate natural nobility lead to be spontaneously given artificial rank as a result, men may confuse themselves with an achievement of natural nobility additionally in case that men would be given artificial rank in first, showed up in their attitudes and actions often times. Cultivating natural nobility comes before artificial rank, but artificial rank doesn't come before natural nobility. JAST is able to provide services freely to a wide range of applications due to its independence of large corporate groups which would restrict its business activities. JAST's main business includes the following four segments, but in recent years the Company has endeavored to expand JAST brand services and raise their share of total sales. Specifically, medical information (health insurance claim automated inspection) services, "BankNeo" bank CRM solutions services, and "Kyoto Zen Temple Tour" smartphone applications are amongst the JAST branded products and services created. JAST boasts of a long track record with some of Japan's largest corporations including Fujitsu Limited (Direct transactions for 36 years), Panasonic Corporation (31 years), and IHI Corporation (31 years). Furthermore, the business transactions with these major corporations have been conducted directly, without having to go through intermediary companies. Because the transactions have been conducted over long periods of time, JAST has become a "core partner" of many of these companies, and it has been able to secure a relatively stable amount of orders even during periods of economic weakness. At the same time, the concentration of sales to the main eight long term clients had been as high as 80% but has now fallen to 38% currently. Furthermore, the number of new clients has grown as shown in the chart below. 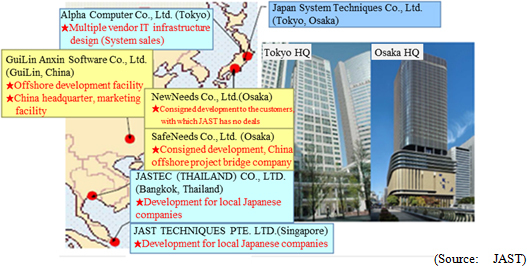 JAST is noted for its corporate structure with its two headquarters based in Tokyo and Osaka, and its early facilitation of overseas development facilities. Furthermore in August 2006, an expansion in the university market with expanded services in the education realm was undertaken, with a focus upon large universities in the Tokyo metropolitan region. As part of this expansion, all of the shares of Alpha Computer Co., Ltd., which boasts of a strong track record in sales of system related equipment, were purchased. Consequently, the large scale deployment of system integration business (SI business) including the provision of packages, information equipment, and networks has become possible. In addition, JAST Medical Insurance Checking System (JMICS) has been spun off as a separate business entity, and JAST acquired 3.66% of the total shares issued by ODK Solutions Co., Ltd. for cooperation designed to expand both companies' businesses in the realm of education in July. 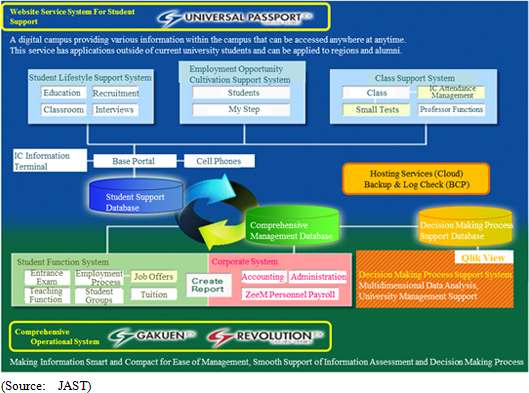 The integrated packaged software that provides management reform solutions for universities has been implemented by 339 universities (As of November 11, 2013) since its launch in October 1994, and has come to be regarded highly by the educational institution market. In particular, JAST's packaged software covers a wide range of operational functions in a wide range of applications from large comprehensive universities to smaller junior colleges. Furthermore, simple setting of parameters by universities allows the packaged software to be used flexibly. In other words, this software's lack of any need for customization contributes to reductions in overall user costs, including both implementation and maintenance costs. Moreover, the implementation cost ranges between ¥100,000 to several hundreds of millions of yen. As a strategy for dealing with the declining birthrates and aging population, most all universities are endeavoring to improve their management quality and student services in order to acquire superior students. However, the majority of the some 1,200 nationwide universities, including four year colleges and two year junior colleges, still primarily use systems and packaged software that have to be customized to match main frame technologies. Consequently, JAST's products are superior in both quality and pricing. In addition, the services ranging from the initial operational function support, operation services, KIOSK terminals, OEM equipment, BCP countermeasures, student cultivation support, management strategy support and other comprehensive IT services are a key characteristic of JAST. On a year-over-year comparison, sales and ordinary income during the first half rose, with ordinary income exceeding estimates by a large margin. At the same time, net income was basically in line with estimates. In addition to the traditional three business segments, the inspection and analysis related services have been added as the medical big data business segment as of the first quarter of the current fiscal year due to its increasing influence in value terms. Service / retail industry is trending favorably, on the back of a recovery in the financial industry. "BankNeo" a data integration package for financial institution which had no sales in September of the previous term, recorded sales of four units in September 2013. Declines in university use program product and SI sales compounded increases in costs arising from next generation product development and business deployment in China, and contributed to a large decline in operating income. In addition to the contribution from the favorable earnings of Alpha Computer Co., Ltd., large increases were recorded orders from system integration (SI) projects for public sectors. 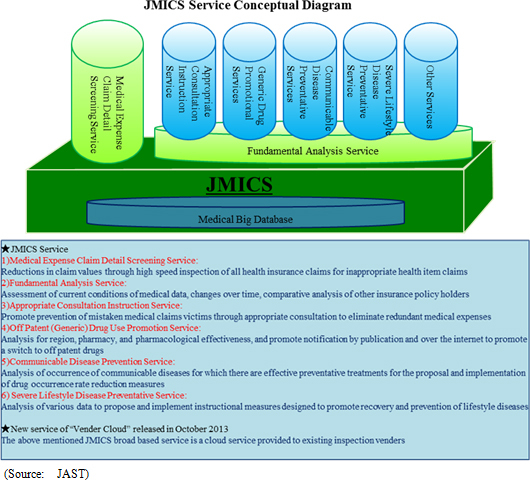 The number of customers of medical information services rose from 17 in September 2012 to 38 in September 2013. Furthermore, the number of health insurance claims processed expanded to 2.40 million per month. In addition to automated check of health insurance claims, the number of insurance policy holder numbers has increased through an expansion in services to include notification services and data analysis. An increase in cash and deposits accompanying an increase in short term debt was recorded, but a decline in receivables was also seen. Consequently, current assets fell by ¥642 million. Furthermore, increases in long term deposits and marketable securities contributed to a ¥189 million rise in noncurrent assets. However net assets declined by ¥84 million. At the same time, payables declined by a large margin of ¥369 million, while short term debt increased. Consequently, equity ratio increased from 55.0% at the end of March 2013 to 57.1% at the end of the first half. Increases in receivables and inventories, and decreases in payables and prepayments received contributed to a net outflow of cash in operating activities. Deposits were recovered, but acquisition of marketable securities contributed to a net outflow of cash in investing activities. A net inflow of cash was recorded in financing activities due in part to an increase in short term debt. Consequently, cash equivalents declined by ¥155 million from the end of the previous second quarter to ¥1.8 billion at the end of the second quarter. JAST maintains a cooperative relationship with ODK Solutions Co., Ltd. (JASDAQ Stock Code: 3839) for mutual data services of university use systems. In order to further strengthen their relationship, JAST purchased 3,000 shares of ODK Solutions in the market. JAST's GAKUEN series of products is a strategic management system that offers integration function ranging from corporate office task systems dealing with accounting and administration to educational institution task systems dealing with entrance exam and students' job hunting support upon graduation processes. JAST established a business alliance with ODK Solutions, which provides entrance examination publicity support services and information processing outsourcing services for entrance examinations for the same educational institution clients, one year ago for the collaboration on mutual use of data. Against this backdrop, JAST and ODK Solutions have leveraged their mutual strengths to extract business synergies and to expand their track record through cooperation. Both companies share the common recognition that these efforts serve to raise corporate and shareholder value, and therefore have taken the decision to strengthen their business cooperation. Both companies will consider and determine which business fields and realms to cooperate on, in addition to the realm of educational institutions. Furthermore, both companies will promote ongoing consideration of projects outside of the education realm given the considerable potential for cooperation in other fields. At the current point in time, no changes have been made to full year earnings estimates. Growth in the software business is expected to contribute to growth in sales and profits. Details of the increase in ordinary income are described below. The Lehman Shock in 2008 is recognized to have marked a large turning point for the information services industry. Before this event, JAST had been able to secure high operating margins of over 10% through its traditional business with long term, superior clients that comprised over half of all of its clients. But after the Lehman Shock, the business environment changed dramatically, making maintenance of growth based on a high level of reliance upon consigned development difficult. In addition, the recovery being experienced near term is far from full scale, and the unstable environment is expected to continue for the foreseeable future. Against this backdrop, JAST will implement reform measures to "1) establish the JAST brand," "2) promote an alliance strategy," and "3) promote a global expansion." After subtracting the first half ordinary income results from the full year estimates, the ordinary income target for the second half is ¥239 million. This compares with ordinary income of ¥141 million during the second half of the previous fiscal year. While its main customer industry market continues to recover, strong contribution from sales of BankNeo are anticipated and a strong pricing trends and disappearance of opportunity losses and unprofitable projects are keys to achieving the second half targets. Second half ordinary income target is ¥192 million, and compares with ¥167 million recorded during the previous first half. In addition to activities to capture extraordinary subsidy demand, weakness in the Kanto region is expected to be resolved during the second half and to offset the deficiencies seen during the first half. Because next generation products will enter the manufacturing stage, research and development expenses are expected to increase by 2.5 times. "GAKUEN China Version" is expected to be released with sales to Chinese universities expected to be booked. Along with passing of the sixth year since the release of the GAKUEN series and its establishment as the top brand, pricing competition has begun to intensify along with the appearance of competing products. And while high profitability is still maintained, growth in sales has begun to weaken. The next generation product is not merely a simple improvement on existing versions, but is based upon a complete renewal of the function, design, services, and platform of the product. Furthermore, this next generation product is not merely a response to competing products, but it has been developed with optimized functions that take the future environment for universities into full consideration. Basic research for the fundamental concept of the new product was completed during the previous term, and development will be promoted from the current term onwards with additional components and related comprehensive services being considered as well. During fiscal year March 2018, sales of the next generation package version is expected to grow to over ¥2.0 billion and exceed sales of the current version. 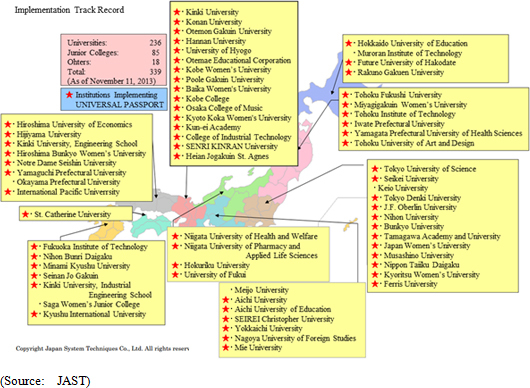 As shown in the table below, Japan's university informational services market has reached maturity. Consequently the decision was taken to aggressively deploy business in China based upon the high growth expected in that market. In the business deployment in China, the subsidiary SafeNeeds Co., Ltd. and GuiLin Anxin Software Co., Ltd. are key strategic companies. Based upon an understanding of the differences in language and university systems in China, Chinese system engineers help to convert GAKUEN into a product which has strong sales potential in China. With regards to the marketing function, a network connected to government and university employees was established as part of efforts to secure sales channels and conduct promotions to information processing departments of universities. The reliability of the JAST product is expected to act as a strong advantage in their marketing efforts in China. An agreement with Huzhou Teachers College (Huzhou City) for information services was signed in May 2013. In this manner, aggressive marketing activities will be conducted based on the formation of business operations in China, and JAST targets the implementation of its software at several universities in fiscal year March 2014. The second half ordinary income target is ¥2 million, and compares with ¥39 million in the previous second half. Sales to public institutions continue to trend favorably, and the possibility of the achievement of targets is high. JAST will endeavor to exceed its targets. Second half ordinary income target is -¥20 million, and compares with -¥52 million in the previous second half. While these estimates are likely to be the most difficult of the four segment targets to achieve, efforts will be made to expand sales of this fourth segment and to establish its own brand of services. Its strategy call for achievement multiple objectives including increases in processing numbers, normalization of pricing, achievement of profitability in cloud services, and reduction in development and operational costs. Since the start of paid for services in April 2011, the number of health insurance claims and clients has steadily expanded, with particularly strong growth seen in 2013. Furthermore, a new service called "vendor cloud" was released in October. In addition to the above mentioned services, a cloud service for inspecting vendors has been started. According to JAST, major research and development investments are expected to end in the current term, with the arrival of the recovery phase for these investments and sales expected to grow to ¥500 million in fiscal year March 2015. With regards to sales, the establishment and growth of the JAST brand of products and services is expected to contribute to an increase in own brand to consigned business sales ratio to 1 for 1. Consequently, JAST is on a steady path to a recovery to ¥10.0 billion for the first time in four terms. With regards to profits, JAST is expected to endeavor to improve profitability by balancing ongoing investments with profits in its business restructuring efforts through ongoing promotion of its own brand business. Sales of JAST software business and systems sold by Alpha Computer are trending better than expected, and are expected to continue during the second half. And while the "medical big data business" has yet to contribute to profits, it is expected to contribute strongly to profits in the future. JAST products have come to be highly regarded by its health insurance associations clients because they are able to more easily process the huge number of health insurance claims, which used to be processed manually. In addition, JAST expects to leverage big data to expand new businesses. An example of this is the potential for JAST to leverage the aggregation of huge amounts of big data to propose a switch from prescribed drugs which are used in large volumes to generic drugs as a means of improving the financial standing of its health insurance associations clients. A key point of JAST's strategy will be the speed with which it can transform its business model to one which boasts of a higher sales composition of own branded products and services. Copyright(C) 2014, All Rights Reserved by Investment Bridge Co., Ltd.